Relating to how a living thing seems to be without life or how a creature lacks the ability to move: Tom's elderly mother was inanimately lying on the floor of her kitchen when he arrived even though she was still breathing and so he called the ambulance to take her to the hospital. An absence of life or motions: For Jill, the morning seemed to be in a state of inanimation because there were no sounds or movements that could be perceived. 1. Great generosity or noble-spiritedness: Many people show much magnanimity by donating a lot of money to charity groups. 2. A generous, noble-spirited act: Jack’s father often showed magnanimity; such as, offering to take Patricia to school on rainy days instead of having her wait for the bus to pick her up! 3. 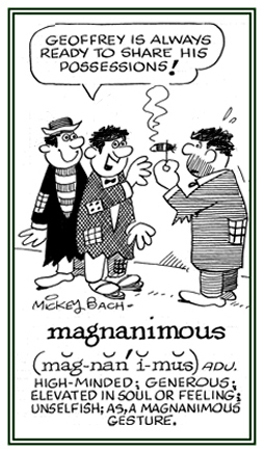 Etymology: "loftiness of thought or purpose", from Old French magnanimite, "high-mindedness"; from Latin magnanimitatem, magnanimitas, "greatness of soul, high-mindedness"; from magnanimus, "having a great soul", from magnus, "great" + animus, "mind, soul, spirit". © ALL rights are reserved. 1. 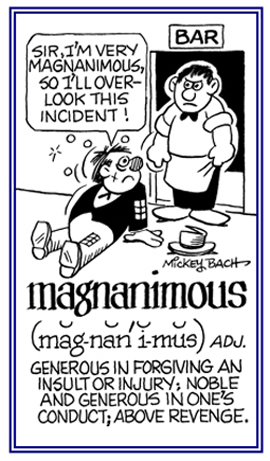 Pertaining to being very generous, kind, or forgiving: Mary’s supervisor, Mr. Deal, was quite a magnanimous man when he understood why she had come quite late to work that morning. 2. 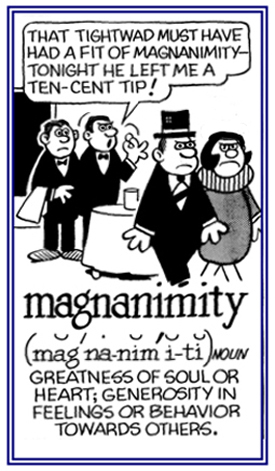 Etymology: from Latin magnanimus, "noble and generous"; from magnus, "great" + animus, "great-soul" or "big spirit". © ALL rights are reserved. A motto of Colby-Sawyer College, New London, New Hampshire, USA. Smallness of mind or a small-minded person who is mean, selfish, or rude: Edgar showed a lot of parvanimity when he wouldn't loan his sister a pen when she needed it to write a note while she was talking on the phone. Referring to a lack of concern or consideration for others: Irene was not being a parvanimous person when she went to help her neighbor who had just fallen down on the icy steps when she went to her mailbox to see if she had any letters. 1. Timidity, cowardliness, faint-heartedness: The novel Susan was reading dealt with a girl whose pusillanimity kept her from developing into a very talented pianist. 2. A lack of firmness and strength of mind which constitutes courage or fortitude: Steven's mother didn't know whether he was very lazy and therefore just procrastinated with his homework, or if pusillanimity was his problem, which had to be dealt with in another way. 3. Weakness of spirit; cowardliness: Timothy was very outgoing and possessed great courage while his brother, Tom, showed quite a bit of pusillanimity since he avoided everything that might be new to him or could present problems. 4. 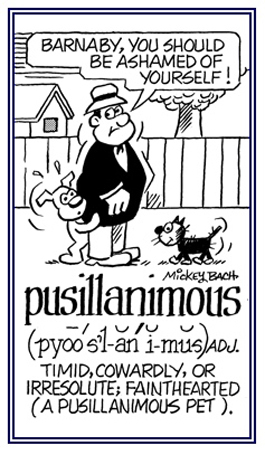 A feebleness of mind which shrinks from trifling or imaginary dangers: Ed's aunt was very old and became quite timid and insecure with time and this pusillanimity kept her from trusting other people because she thought one of them might steal something from her house! 1. Characterizing the lack of courage and manly strength and resolution; cowardly; faint-hearted; timid: Even though both boys had grown up together, Christopher was very brave and outgoing, while his younger brother, Rob, was noted to be a pusillanimous person who was afraid to do anything new or to be with strange people. 2. Referring to a lack of boldness and resolve. Jill's cat was very daring and chased a fearful and pusillanimous dog down the driveway and out onto the street! Little Mary was very pusillanimous when people arrived at her home because she always hid behind her mother’s skirt or apron when seeing them. 3. 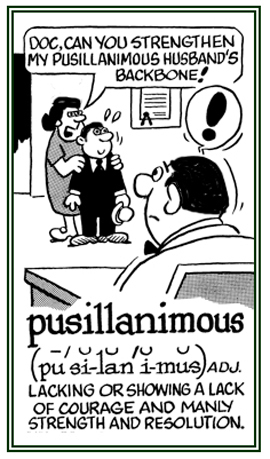 Etymology: from Latin pusillus, "very small" and animus, "mind". © ALL rights are reserved. 1. Regarding how something is done or said with a lack of courage and determination: Janice wasn’t sure about joining the group of climbers, so she pusillanimously responded to their invitation by saying she had a headache and was not feeling well. 2. Relating to acting in a timorous, fearful, or frightened way; cowardly: The accused thief begged pusillanimously for mercy because he was about to be put into a prison cell with other prisoners. The state or condition of being very apprehensive or fearful: The pusillanimousness of some of the tourists was quite apparent and they were all very nervous and backing away from the hanging bridge above the deep gorge they were supposed to cross. 1. To revive; to make alive again; to restore to consciousness: After the road accident, the driver of the car had to be reanimated or brought back to life because his heart had stopped functioning. 2. To give a fresh heart or courage to a person or a thing; to stimulate and to renew: When the lead singer quit the chorus, it seemed to fall apart until one day a new soprano offered to be the voice of the group and so it was reanimated! 3. To impart fresh vigor, energy, or activity to something: Knowing that she was going to spend the weekend with her family at the amusement park seemed to reanimate Julie and kept her excited about going. 1. The action of restoring to life: After resuscitation, or reanimation, Mr. Charles revived from his apparent death after falling from a tree in his backyard. 2. The fact, or process, of returning to life: The nerve condition in Jane’s legs made her immobile, but after her rehabilitation and reanimation, she slowly made progress so that she could take her first steps after three months of medical treatment! 3. Renewal of vigor or liveliness: Apparently having a good meal gave Thomas the energy and reanimation that he needed in order to proceed with studying for the final exams that were taking place the next day. A holiness of the mind: Little Mary seemed to live in a world of her own, believing only the good in people, and her parents wondered about this sanctanimity and talked to their reverend at their church about it. 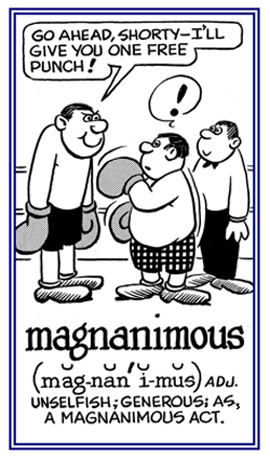 Showing page 4 out of 5 pages of 68 main-word entries or main-word-entry groups.